There’s probably no DNA marker of theatrical talent — or any other skill — but there’s some reason for the adage, “The apple doesn’t fall far from the tree.” Case in point: Adam Blachly. The 9-year-old who just concluded an impressive run in Lost Nation Theater’s To Kill a Mockingbird is the grandchild of Unadilla Theater owner/director Bill Blachly, and the son of actor/attorney Tom Blachly and singer-songwriter/librarian Susannah Clifford Blachly of Marshfield. 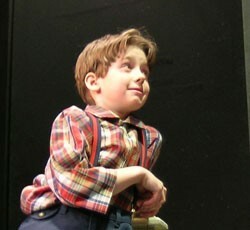 In her review of the production in last week’s Seven Days, Elisabeth Crean called the third-generation phenom “the unexpected star of the show,” noting the young Blachly “captured Dill’s too-wise-for-his-size essence, with a perky, eager and utterly fearless stage presence.” Adam’s already had plenty of practice. ?The Mikado opens the Unadilla Theater season on June 25 ?and runs in repertory through August 9. Info, 456-8968 or www.unadilla.org.